This week we’ll discuss the metaphysical properties of Double Terminated quartz crystals; what they are, how to determine if you have one, and how to work with their unique energy. We discussed crystal Clusters in an earlier post. We mentioned at that time that there are some crystals which don’t grow on a matrix, they basically grow from a “seed” of silicon dioxide in clay. That is what we’ll discuss in this blog post: Double Terminated crystals. WHAT ARE DOUBLE TERMINATED CRYSTALS? Double Terminated crystals have a termination on both ends. The point or end of the crystal is called the termination. It is confusing to refer to a single crystal as a “point” and to also call the end of a single crystal the “point,” so we call the pointy end a “termination”. Sometimes Double Terminated points may almost appear to be in a “ball shape” because the sides are so narrow in relation to the terminations. As I mentioned earlier, Double Terminated crystals grow from a “seed” molecule of silicon dioxide in clay and grow outward in both directions. They are not formed on a matrix. The energy in these crystals flows in both directions as well. HOW DOES THE ENERGY FLOW DIFFER? In single terminated crystals, the energy is directed from the base (bottom) and out the top (termination). Based on the growth pattern, crystals with two “pointy ends” (Double Terminated crystals) don’t have a base or bottom as such, and the energy may be directed (flows) both ways. Even though they have two terminations, usually there is one end that feels like the “top” and one that feels like the “bottom.” Naturally Double Terminated points that are exactly the same on both ends don’t have this “top” and “bottom” feeling, but they are rare. 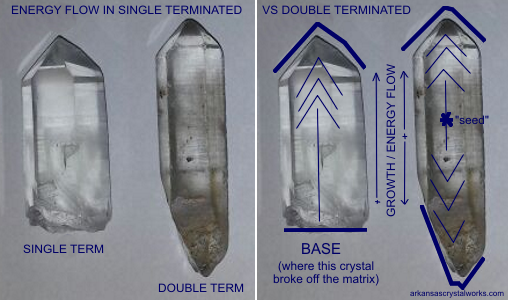 Single terminated crystals (those which have broken off a matrix) are sometimes polished to have two terminations, but they will have the energy of a single terminated crystal (energy flowing from what used to be the bottom out the top). Double Terminated points may occur as single points or they may be clustered or grown together. Remember the Dolphin crystals from last post? Here is a Dolphin crystal that is also Double Terminated. WHEN MIGHT A PERSON CHOOSE TO WORK WITH A DOUBLE TERMINATED CRYSTAL VERSUS A SINGLE TERMINATED CRYSTAL? Double Terminated points send as well as receive energy, so they promote psychic ability and dream recall. They are also used for balance. Double Terminated crystals are useful in any application in which you want the energy to flow in both directions. I like using them in healing layouts or grids because of the bi-directional energy flow. 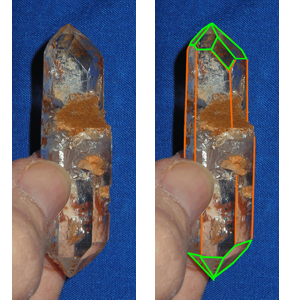 In the photo grid example, there are two pink, double ended arrows on the two Double Terminated crystals. The other crystals are single terminated, and the arrows (energy) is directed primarily one way. Don’t let the arrows and energy direction confuse you, however. All crystals (both single and double terminated) are capable of both sending and receiving (there is no “stop valve” inside which prevents the energy from flowing both ways)… It is just helpful to remember that the energy is most focused or directed in the direction of the terminating end. Meaning x=====> or <===x===>. The differentiating terms would be flow (all crystals allow energy to flow) versus direction (energy may be more easily directed out the terminations). A further (visual) example would be this: One might hold a single terminated crystal in their hand and point (direct) energy to a source… ZAP! (think crystal wand). On the other hand, one might hold a Double Terminated crystal in their hand to direct energy outward, while at the same time, accepting a return of energy inward. Double Terminated crystals grow from a “seed” rather than breaking off a matrix. The energy in Double Terminated crystals flows in both directions like a double ended arrow. The crystals may form in “single” points or may grow in clusters of Double Terminated points. Double Terminated crystals promote psychic ability and dream recall. Double Terminated crystals are useful in any application in which you want the energy to flow in both directions, such as healing layouts of grids. 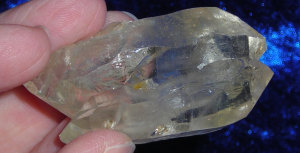 I hope you have enjoyed this discussion about Double Terminated quartz crystals; what they are, how to determine if you have one, and how to work with them. Next time we’ll discuss Dow or Trans-Channeler quartz crystals. Tagged choosing your crystal, crystal types: double terminated, crystals, how to, metaphysical descriptions. Bookmark the permalink. Hi can you please recommend at place online that sells real authentic double terminated crystals. Thank you for all the great information. Your explanations are easy to understand and very helpful for a “newbie” like myself. Thanks so much. Hey Terry! I’m glad you find the blog helpful. Thanks for taking the time to comment! Hi: Can DT crystal be used as a pendulum? Sure. Just about anything can be used as a pendulum. I would suggest finding one that is affixed so the terminations are situated North/South. I have a double terminated crystal I’d like repaired, any suggestions or recommendations? Where I can take it to be repaired? Hey Lisa! What exactly is wrong with it that it needs “repair” ? I can better answer your question with a bit more information. Thanks! It is chipped at the pointed end. You really can’t fix a chipped point (other than polishing out the chip). But before you take any steps, consider reading this post about Empathic (chipped and or damaged) crystals. Hi just wondering if my double terminated clear quartz can be used during crystal healing sessions for clients is so how to as I’m really used to using single terminated. Hey Marilyn! Yes, absolutely!! If you are accustomed to working with single terminated crystals, you can simply swap them out for your doubles. It will give your working a boost. Depending on how you use the singles, you simply tweak your intent. For example: if you hold your crystal in hand and your intent is to infuse energy INTO the client, then with a Double, your intent may be to infuse energy (healing) IN and to pull discordant energy OUT at the same time. If you LAY your crystals on or around your client, if you situated your singles either toward or away from your client, then the Doubles would be able to run the energy in both directions (in and out). In with the “good”, out with the “bad”. Simple, really! I hope this description has helped. If not, please ask and I will help clear any questions up. Happy healing! Hi Genn, This is helpful here; thank you. I have a double terminated (cut) clear quartz crystal that I purchased some years ago for some shamanic studies I was doing. I’m now wanting to possibly use it to enhance the quality of a supplement I’m getting ready to make called ormus. Do you have any suggestions as to how I might best do that with the crystal? Thank you again. Hey James! Sorry for the delay in responding! I usually suggest placing the crystal near or on the supplement rather than IN it, but it is 100% up to you. I personally do both. It is helpful if you program your crystal, which is simply telling it what your intent is so it and you can be on the same page. Here are several blog posts on programming, maybe they will be helpful to you. Happy Ormus making! Hola Ivannia! Yes, Double Terminated crystals are good for energy work which flows both ways. I suppose one would work if converted into a pipe, though quartz is quite hard and would have to be tooled with a diamond bit. Most certainly when you find the crystal, you should first ask it for permission and if it wants its shape to be converted into a pipe for medicinal smoking. Thanks so much for your question! Let us know how it turns out! Hey David! It depends on how much of the point is broken off. If broken off completely, it will effect it, (also you wouldn’t know if it is a DT or not right!?) but if partial, the energy still flows in both directions. It might be less precise but it will still flow. I tend to see people work with broken DT crystals in applications where they might not see the point such as in Orgone Generators. Thanks for asking! Well, one can tell it’s a DT, but 3/4 of the end is gone on one end. Super seven crystal. Thanks, David! The energy will still flow in both directions, since that is how the crystal grew (from the center out). Even if the entire end was missing, this still holds true, but like I said, unless one was very sensitive to a crystal’s energy, one might not be able to tell this for certain without the clue of the partial remaining tip. Thanks for commenting, and enjoy your crystal!! I am taking my time with studying your descriptions of the various quartz and how best to work with them…savoring actually. It is helpful to have the outlines to see exactly what you are talking about, so many thanks for helping us all! Sending happy thoughts your way. Thanks, Cheryl! I’m very happy that my descriptions are helpful! My pleasure! Enjoy your course! Thank you, this information was extremely helpful. I had not found a single site to explain double termination as clearly as you did.